Here is my card this week for 2sketches4you. The uber talented Laura created the sketch this week. I have many ideas for this one and if I can get another card done with this sketch, I will try to get it posted. There is also a bonus sketch from Dawne that I hope to get to, too. I combined the sketch with the caardvarks challenge to use a critter on your card. I love it when I see a sketch or a challenge and I sit down in my scrapbook room and the card just comes to life. It is my escape from the world down in my scrapbook room while I create a card, layout, or alter something. I just went and purged many things from my stash and cleaned my room up. I am still working on some organizing and my room was badly in need of a cleaning, so it feels so nice to sit down in my clean space. If anyone is interested, I will post here and let you know when I list my stuff (mostly retired Stampin’ Up! sets) for sale. All Supplies are Stampin’ Up! (with the exception of the thread). I used my Nestabilities for the scallop circle on the front. How fun is that cute little bee ... adorable critter creation. Absolutely adorable card Amy! Thanks so much for joining us this week at Caardvarks! 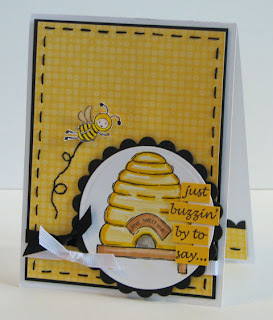 oooh what a ♥HONEY♥ of a card! i looooooooove the outside *AND* the inside! what a sweet treat for whomever receives this beautiful creation! Very, very cute! I love the thread around the card, how cool! What a fabulous card !!! One of my favorites !! 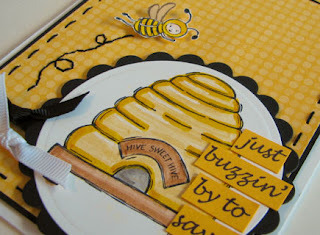 just love the cute bee and beehive on you stamped for this card. It's so adorable! what delightful cards! i love them both!! What a smashing card! I just love the bright colour and all the cute details - vellum for wings is just such a great idea! OMGoodness! This is too cute...inside and out! Love the hand stitching! Holy Moly!!! This is waaaay too cute!!! Oh THAT is all kinds of cute! Great detail!